traveling through, this world of woe. I’m just going over home. Micaela Aldridge is a High School sophomore who is interested in singing Classical music as well as a wide range of Folk, Jazz, and Contemporary. She occasionally sings in an Irish Folk group called “Dugan’s Hooligans”, and has traveled with them throughout NJ in towns like Madison, Denville, and Morristown. She has also attended many Music Festivals, including Brevard Music Center in Western North Carolina, where she will be returning this year to study Classical music and singing. She hopes to continue her Classical studies in college and become an Opera singer. Educated in Classical, as well as Celtic and American folk music since the age of 6, Connor Dugan is a young violinist for the Baroque Orchestra of North Jersey, the NJ Concert Opera, and frequently accompanies the Harmonium Choral Society in their critically acclaimed concerts. But his talents aren’t limited to just one instrument. Dugan also earned the first place championship in the Mid Atlantic Irish Fiddle competitions twice in a row — in addition to several other prestigious wins — and has been described by the New York Times as a “virtuosic fiddler.” He filmed this amazing rendition of Wayfarin’ Stranger expressly for HoSprings. Matthew Michael was born and raised in a mid-sized suburban town in Central New Jersey. Growing up with a passion for creativity and a love for making noise, Matthew picked up his first guitar at age thirteen and, despite short stints where his creativity traversed other mediums, has kept his love of music alive as a musician through various pursuits. Playing in jazz bands throughout his high school years, Matthew continued to evolve as a musical artist in college, joining several local bands including Postmark Twain and The Constant, in which he currently plays bass. Matthew holds a Masters of Arts degree in Counseling, and hopes to integrate his loves into a lifelong journey. Matt wrote the song Wandering Feet expressly for Ho Springs. ArleneWow! is a solo musician who performs frequently throughout the northeast, particularly near her hometown of New Haven, Connecticut. “Dirty Road Home” has won first place in “The Best Song In The World” a quarterly online contest hosted by Gary Allen of the Charlie Daniels Band, and ArleneWow! was also nominated for best solo artist of 2008 by the Hartford Advocate . Check out the ArleneWow! website. Jim Gaven joins Matt Michael on the new song Lost and Found. Jim has a passion for music and has been playing guitar, piano, bass and drums with his heart and soul since high school. As a creative outlet, Jim writes and records on a daily basis, constantly evolving as an up-and-coming artist. Armed with the goal of helping others, Jim remarks “I want to write songs that make you think of a good time in your life, make you feel good about yourself, and most of all, put a smile on your face. I want to make a positive difference in the world and inspire you to do great things as I have been inspired. I truly believe that music has the ability to do that. The fact that you can create something out of nothing and have it last forever is amazing to me.” Jim’s music has touched many listeners, and will no doubt have a lasting impression on you as well. You can hear more from Jim Gaven at http://www.myspace.com/jimgaven. Son saxo iavne connait toutes les rues par coeur. Et la Seine et ses ponts qui brillent. Rhum au mambo. Joe – Joe – Joe. Le vieux rock au mambo bidon. Dans la nuit vers I’Amazone. Joe le taxi et Yma Sumac. Joe — Joe – Joe. Joe le taxi et les Mariachis. Joe le taxi et le cha-cha-chi. Before Vanessa Paradis was Mrs. Johnny Depp, she was a French child star who broke out at 14 with her hit, Joe Le Taxi. While there are a few different version on youtube of the late 1980s teenage Paradis singing the song in her sweet young voice, this is the one that mesmerized me: She’s years sexier and more knowing than she was in the “official” video, but has not yet morphed into the soigne star who still occasionally growls out her old hit. Every French teenager knows and still idolizes the teenage Paradis, and so I wanted to post this in honor of Juliette. After founding the Be Good Tanyas — a neo-traditionalist folk outfit — 28-year old Jolie Holland burst onto the music scene with her 2004 studio debut Escondida. 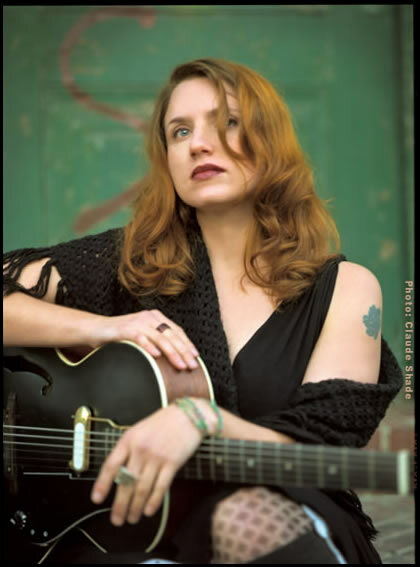 Today, the Texan songstress has three solo albums under her belt — 2006’s Springtime Can Kill You and 2008’s The Living and the Dead — and has staked her claim mixing elements of folk, swing jazz, and country over scattered rhythms and bluesy vocals. You can hear more elegant, homegrown tunes from Jolie Holland here. This interdenominational choir “powerhouse” was founded by gospel radio announcer Greg Harris in 1994. After gaining local fame for their musical ministry, they quickly caught the attention of Cabis Maurice Brown, who insisted they record an album on his label, Leo Records. Before long, Songs from the Heart was born, leading to gigs at New York’s Apollo Theater and even a memorable performance at the 1996 National Democratic Rally in Little Rock, which was praised by President Bill Clinton. You can purchase songs from this Arkansas-based group here. Have you been workin’ in the yard too long? ‘Cause I see that your brow is gettin’ wet. And gather all the cilantro I can get. But time is just a shadow, so they say. And you’ll see that time is just one long today. Have you been lookin’ at the screen too long? ‘Cause I see that your eyes are gettin’ glazed. That mountain trail where our best thoughts were phrased. Has formed to crystals deep within my mind. And I’d say we’ve got an awful lot of time. Patrick Metzger was born in Macon, Georgia, and raised in Chattanooga, Tennessee. He graduated from Sarah Lawrence College in May of 2010. His music has been featured in Hartford Stage’s “Motherhood Out Loud”, off-off-Broadway shows like “Universal Robots” and “Roar of the Crowd”, as well as other music venues in New York City, like Carnegie Hall. He has written music for several student films and dance pieces, and many songs in pop, folk, industrial, and concert music styles. He recently collaborated with Amie Rose and the ECC Singers to create an album of children’s music titled Playing Outside, which can be purchased by contacting Amie.Rose.Anderson@gmail.com. To listen to more of Patrick’s work, click here.